On the first of the month I sent an email to Jeanne, letting her know I would be speaking in her town on the 23rd if she wanted to connect. On the 24th I had not received a response, the event came and went and I did not see Jeanne. Things like that happen sometimes, that’s why I never assume people are ignoring me, rather something happened like this. And while this is just about an inconsequential email (and I easily could have sent a follow up email to her to check if she was free or picked up the phone), the concept of giving people the benefit of the doubt is a good one. they didn’t have the resources they neededMaybe, maybe, maybe. 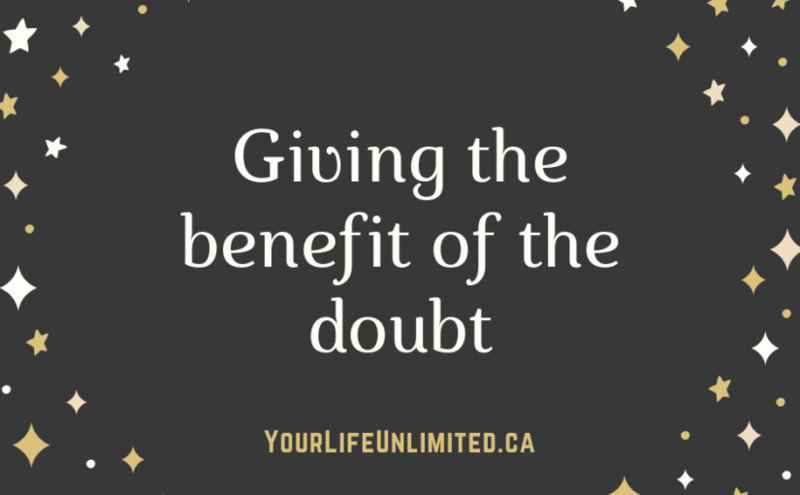 Giving people the benefit of the doubt will likely not only reduce your stress (no, not everyone is out to get you) but may lead to better, stronger, happier relationships. I know that I sure appreciate it when people give me the benefit of the doubt. ___________Consider starting to train your first thought be gentle, kind and compassionate instead of negative, judgmental or angry. Giving people the benefit of the doubt, it’s just one more way to live Your Life, Unlimited. This entry was posted in Communication, Happiness, Newsletters, Relationships and tagged communication, e-news, happiness, Stephanie Staples, Your Life Unlimited. Bookmark the permalink. Previous Previous post: Good Question!